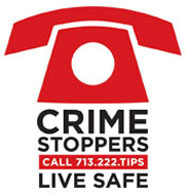 Crime Stoppers and the Houston Police Department’s Robbery Division need the public's assistance identifying the suspects responsible for aggravated robbery with a deadly weapon. Suspect description: Suspect #1: Black male, 18 to 19 years old, 5’8 to 5’9, white shirt and dark pants. Suspect #2: Black male, 18 to 19 years old, 5’8 to 5’9, black pants and black shirt.